Wet bars…what do you do with them if you don’t drink? For years, ours sat as a gathering place of a hodge-podge of stuff. It never seemed to function just right. It always bugged me that this space was never utilized and seemed like such a waste. We drink a lot of coffee in my house. 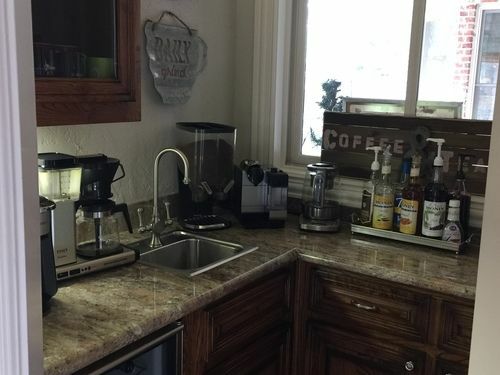 We started out with one coffee machine in our kitchen, but when the newer coffee machines became much taller (and didn’t fit under our kitchen cabinets) and took up too much space, we moved them in to our butler pantry. This was a nice compromise since they were out of the way, but the inconvenience of having to walk from the butler pantry to the kitchen to rinse out the carafes and fill them up got old real fast. We don’t have a sink or a trash can in the butler pantry so it became a chore especially when we had to wipe up the dripped water off the hardwoods. However, one day I had a lightbulb moment—the wet bar has a sink and a trash can. We spent a couple hours relocating what was stored in the wet bar to other places and/or got rid of what was not being used. 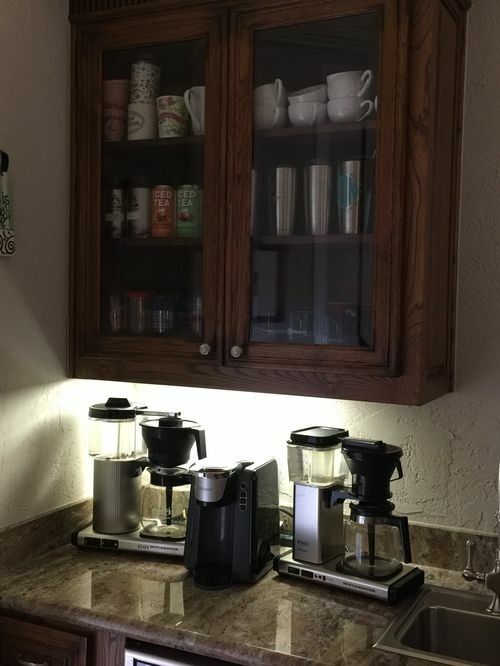 We set up the coffee pots (yes, plural—I already mentioned we drink a lot of coffee), and arranged all the coffee mugs and tumblers in the overhead cabinet. 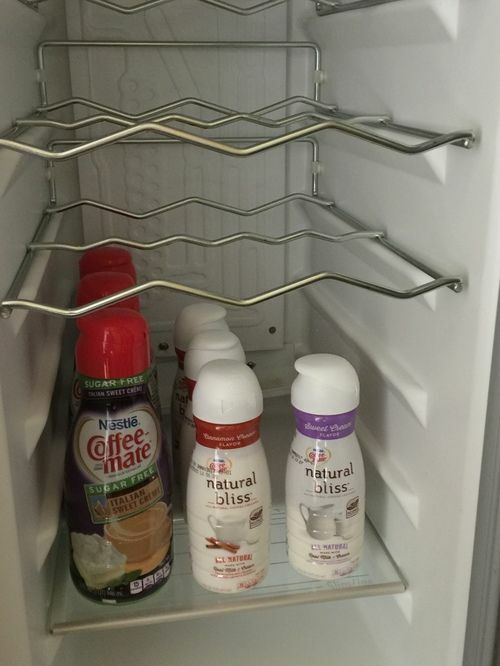 What was once the wine fridge became the fridge to house all the coffee creamers. The area also houses a tea maker and tea since we like that, too. ​We have a coffee maker dedicated to regular coffee, a coffee maker dedicated to decaf coffee, a single serve option, and an espresso machine. Yes, I know this may sound like a lot, but we’ve accumulated these over the years. Every morning, I clean out the coffee pots and get them ready for the next use. Coffee is always just a click away at my house! 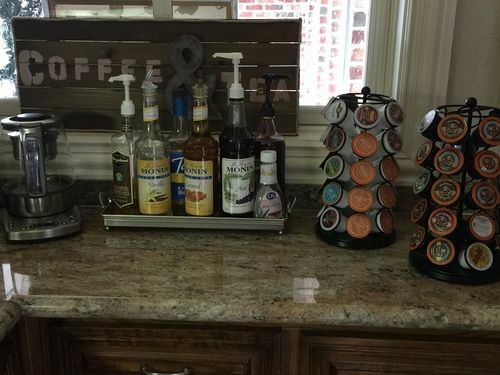 ​Our homemade coffee bar saves me money, too. I rarely go out for coffee unless we are on vacation or I’m meeting a friend. And for the most part, I only buy bulk coffee that is made by small roasters who donate money to ministry-minded organizations. Two of my favorites are Raphael’s Coffee and Revival Coffee. Aside from finally being able to fully utilize this space, the best thing about this project is that it didn’t cost us a dime! We already had everything we needed, and it looks great now, too. It also helped to get rid of “the elephant in the room.” Whenever we have guests over, they never have to question whether we use the wet bar for alcohol purposes or not. We’ve removed any stumbling block about this that might have been an issue to our witness. It’s a win-win all around. 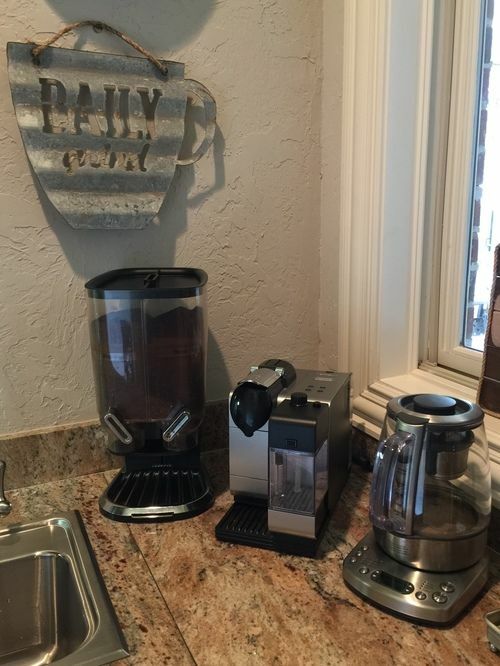 ​I’d love to hear your “coffee bar” stories or any other clever ideas you might have about repurposing spaces within your home.